A natural blend of oils created to deliver a powerful healing product through the combination of Grapeseed, Lavender Flower and Tea Tree leaf oils. Healing & Repair Range Healing Massage Oil contains a base of Grapeseed oil which has a high concentration of vitamins C, D and E which are all known to reduce fine wrinkles and scars on the skin. Grapeseed oil also assists in balancing the pH levels and through this creates a healthy and balanced skin surface. Soybean oil is known to have a high level of omega 3 fatty acid which is beneficial to the skin both internally and externally. It also contains vitamin E which is used to fight off free radicals, reducing the appearance of blemishes, scaring from acne and protecting the skin surface from sun damage. Tea tree oil is known for its antibacterial and its antiviral properties and thus enhances the general health of the skin. It also has antibacterial properties which is enforced with the combination of Lavender oil, known to have a soothing and calming effect on the skin and body. This powerful blend is known to help with the release of spasmodic muscles. Calendula flower extract is a superior moisturiser for dry and chapped skin, while also reducing the pain associated with this condition. 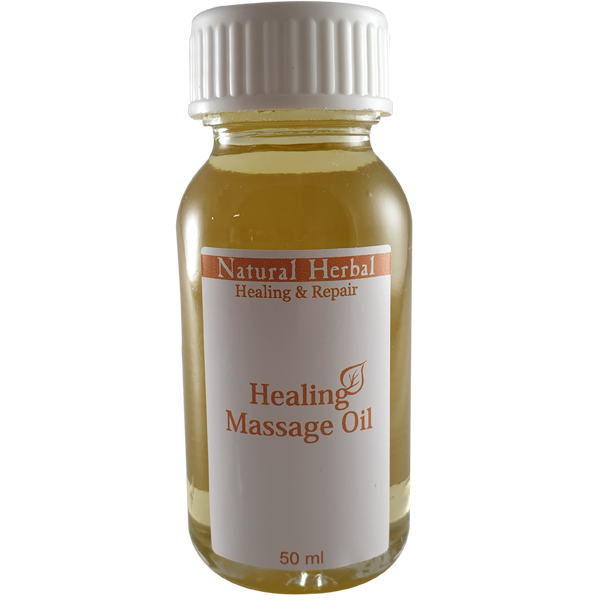 Use as a massage oil to release tension and improve the condition of the skin. It leaves the skin feeling relaxed revitalised and soothed.